This first part of my blogpost series about diagnosis and consultation. We had floorboards for more than 50 years in this house and they still looked very good. Some people said they would never remove such a nice floor, but I was unsure whether the squeaking noises wouldn’t annoy me too much. 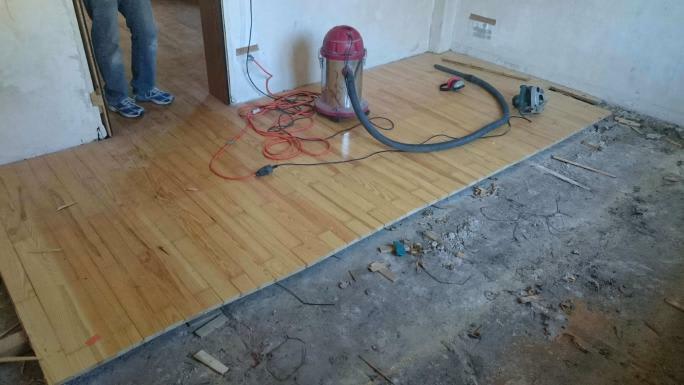 So we decided to remove flooring on 60 square meters and replace it by screed with a vinyl flooring later on. Think in advance for the next five to ten years (depending on your level of renovation) what is or what will become necessary to be done. Plan enough time for this phase to avoid forgetting things in hurry and get upset later on when it is too late! Prioritise them to take easier decissions later on in case your financial investment does not cover all potential costs to cut off some lower priotized things from the list. It was pretty hard for me to take those decisions about what needs to be done and what doesn’t. Especially because I had no idea about all those topics as I never did a project like this before. And of course this also depends on your financial plans, I will talk about in my next blogpost. But in the end I’m personally happy that I was deciding to get a new floor because now, living in my renovated flat, I’m pretty sure that the squeaky floor would have annoyed me in one or two years latest. But then I would not start another such big renovation phase again, so I would probably resign myself with the situation and simply do nothing about it. This step is at least as importand as the first step and in our case they were mutually dependent to each other. In our case it was basically not one BIG diagnosis phase and then one BIG consultation phase, more hundred of small steps behind of each other. Making some diagnosis what needs to be done, searching for consultation, getting new ideas and input, diagnosing again, search for expert help again and again and again. But I think this is more or less the way to go. You can never know anything from the beginning except you’re the professional expert in house renovation or building and you already know every little detail about this area. We started with renovating two bathrooms and replacing windows and doors nearly everywhere in the house and ended up with new screed, vinyl flooring, electricity, radiators and solar cables for a later installable solar systemon top of it! Again… take your time! It is tremendously important that you find companies you trust to work with! Get multiple cost estimations and consultations from different companies and compare their suggestions how to do something and their price. Ask, ask, ask, ask… whatever you want to know about their company, the product, how the company works, how they “would” do something to get a feeling how confident they are in their area and check how fast they respond to your questions to get a first impression whether they would be easy to reach during the realisation. Check your todo list from time to time again: Do you have something to add or remove from there? In the end of this phase you will end up with lot of business cards, ideas and often with the feeling that you are not getting any further as all of them speak disrespectively about their competitors and thus have different ideas, plans etc. So it is on your side to check the hard facts and forming your own opinions for further decisions. The companies will only partly help you with that as they want to sell their own products, service and want to make some money with your renovation. Saying that it is really important that you find neutral persons to ask for help. Might beeing some architects having experience with different companies, products and especially having some vision on how your house or flat will look like after your renovation. Or asking some neutral building consultancy for help. Mainly some persons you know that they will not trick you in the end. I hope that this post will help you to master these two phases. The next blogpost of this series will be about the financial facts of a house renovation.